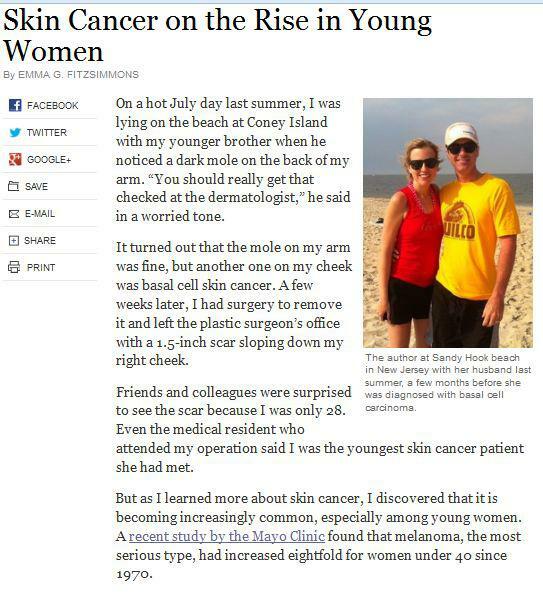 A recent report by the New York Times stated that the risk of skin cancer among women below 40 is steadily growing. In a study conducted by the Mayo Clinic, which focused on patients aged 18 to 39 diagnosed with melanoma from 1970 to 2009, it was found that the incidence of skin cancer increased eightfold among young women since 1970. There are many factors that can cause malignancies on the skin, such as overexposure to the sun’s harmful UV rays, or long-time and regular use of tanning beds. In Provo, Utah, summer temperatures can reach a record high of about 108°F between the months of July and August. If you’re constantly exposed to extreme heat, UV rays, and other toxic factors, mutations in the DNA of your skin cells can occur, and when such mutated cells grow out of control, they could form cancerous tumors or masses. As a preventive measure, and to maintain the health of your skin, it is advisable for you to regularly consult a dermatologist who provides professional skin care in Provo, UT. In the NY Times report, medical practitioners believe that the “too young to contract skin cancer” attitude is one of the main reasons why young ladies fail to take care of their skin early on in their lives. Nowadays, this doesn’t really hold true anymore, since almost anyone can be susceptible to this condition. For that, simple prevention tips like avoiding too much sun exposure that can lead to serious sunburns, putting on adequate sunscreen, and getting skin care treatments from reputable dermatologists can be a big help. It is estimated that severe cases of skin cancer kill about 9,400 people in America each year, while the less-dangerous types of dermal carcinoma takes about 2,000 lives. Fortunately, many established dermatology practices like Stone Dermatology have knowledgeable doctors who can provide you with skin cancer information and screening services. If you find any unusual skin lesions or moles, you should have it checked by a dermatologist at once. If you’re found negative for any type of cancer during your checkup, prevention is still the key. Remember that the summer holds many temptations for you to stay for long periods under the sun. Thus, you should remain diligent in protecting your skin by using sunscreen (at least SPF 50), wearing comfortable clothes, and staying in shaded areas during the hottest parts of the day. Proper skin care in Utah isn’t only the responsibility of your dermatologist. Keeping your skin safe and healthy, especially during the harsh summer season, should also be your priority. This way, you can make the most of the skin you’re in and not be threatened by the evils of cancer.